This week I stumbled across these babies. Yeah, those are super big erasers! 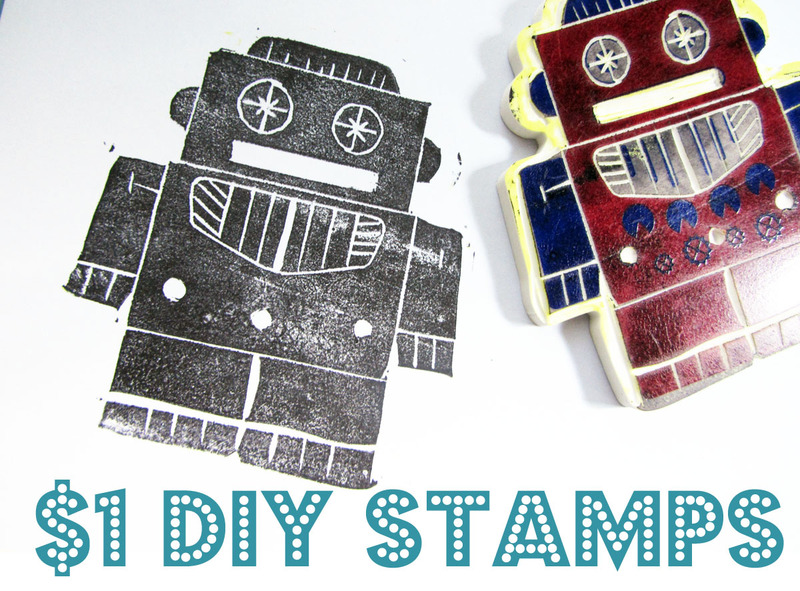 I’m guessing most people won’t get as excited as I did about this- but erasers are a secret medium I like to keep around…FOR STAMPS! 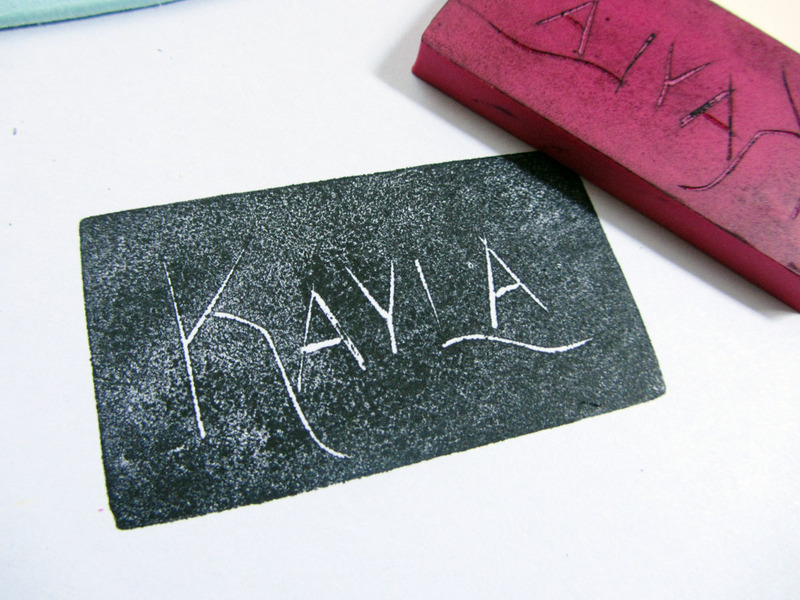 You see, in High school we had a little printmaking expedition in art class, which consisted off carving designs and then making prints from a giant slab of rubber. Once the class was done with those slabs, they were chopped up and distributed throughout the school. Why? Because they were nothing more than giant white erasers. I’ve kept that little tidbit of info locked away in my brain for years. 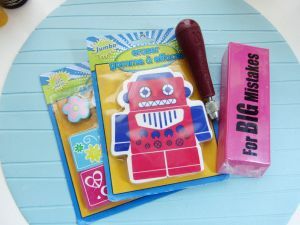 When I saw these giant erasers- It clicked! 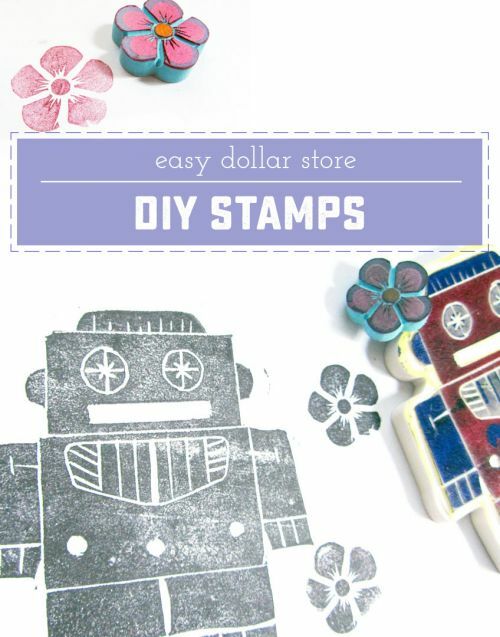 These are especially nice because the larger sized stamps can get REALLY pricey in stores! Firstly, gather your erasers. I found these fancy printed type to be EXTREMELY nice because you can just follow the printed design! No need to plan out or create your own! Now, using your carving tool, begin to trace your design. 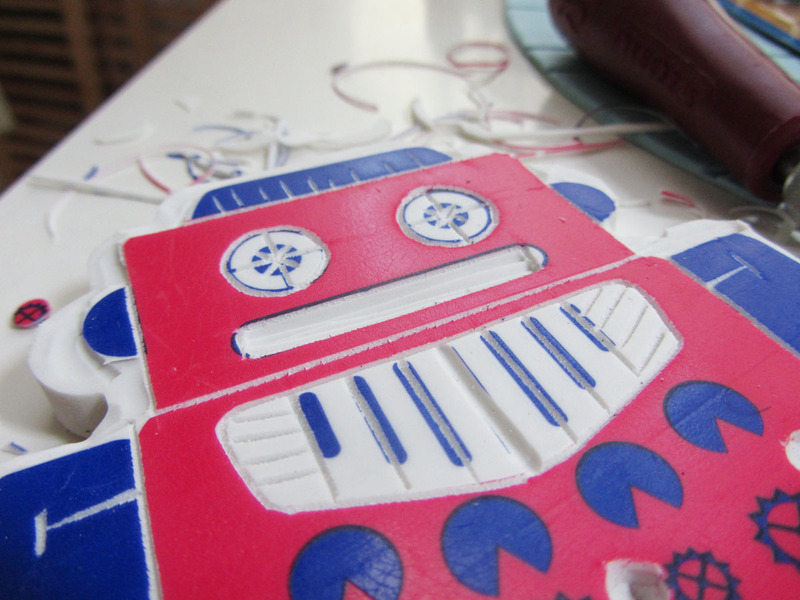 There may be large areas that you will want to carve out later- but for now just do the outline. 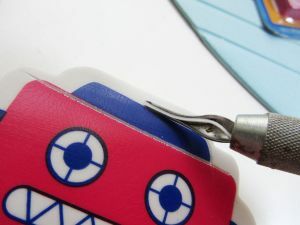 Once the outline is done, you can go back and remove larger areas. (For me, it was the background behind the robot.) 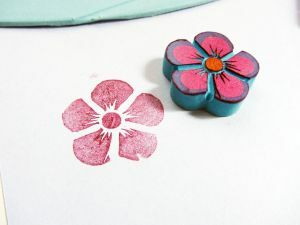 Keep in mind that you are carving away what you DON’T want to appear on your stamp. You carve away what you want to be blank, and leave what you want to pick up the ink. Um. That’s it. Man, I really feel like I should make up a couple more steps… but there aren’t any! Ink that bad boy up and press it down on some paper! Be sure to put pressure all over the stamp! Try it on some littler erasers too! There were probably 15 different illustrated erasers at the dollar store when I went. I just outlined this pretty flower one and its so cute! 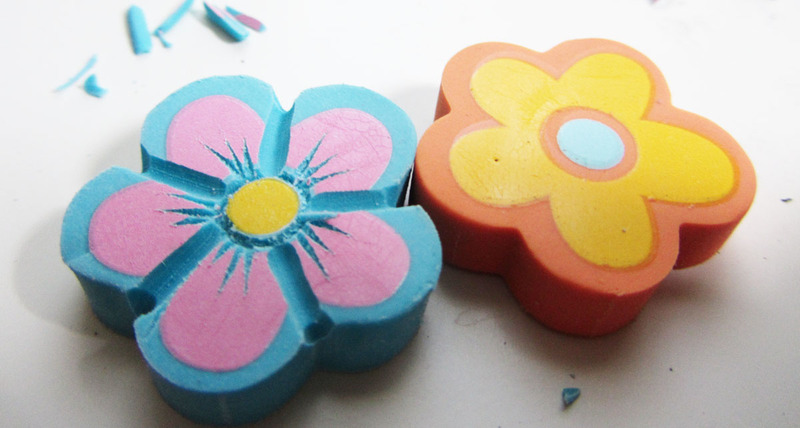 Oh, and you can of course start on a blank eraser and make your OWN design! How fantastic an idea is this?! LOVE IT! 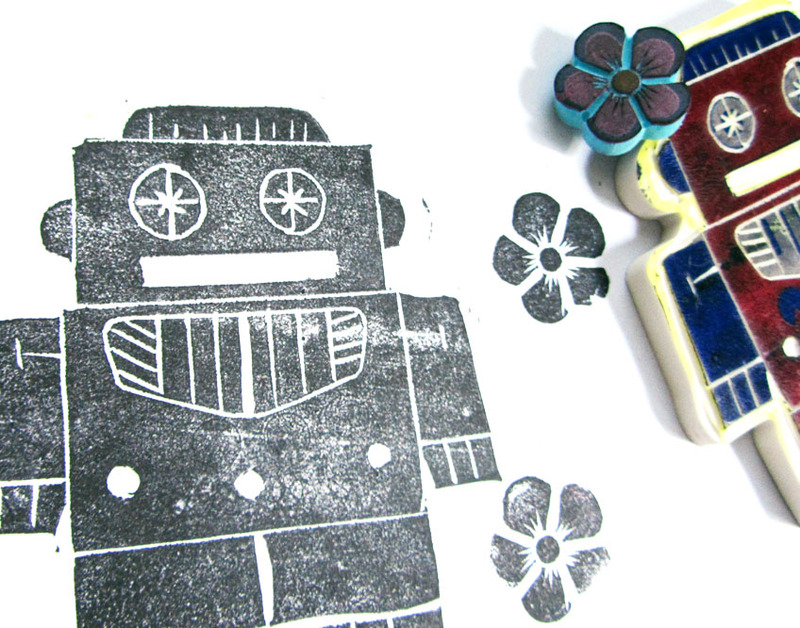 That robot is just the cutest stamp ever. I am going to have to try this. Thanks for the tutorial. I LOVE it! What a brilliant idea! So cute! I love inexpensive with a great payoff. Oh my gosh Thanks so much!!! Great idea! I’ve heard about carving erasures to make stamps but have never done it. Finding an already shaped erasure to start out with sounds easy. I have the same love for dollar stores! Thanks for sharing! Thanks for this great idea. I would have never thought to do this. I’ll be sharing this on my blog this Friday.